The Inventory II module for Microsoft Dynamics AX is the right choice for companies looking for advanced inventory management, real-time costing, high scale transaction capabilities or 24/7 operation. 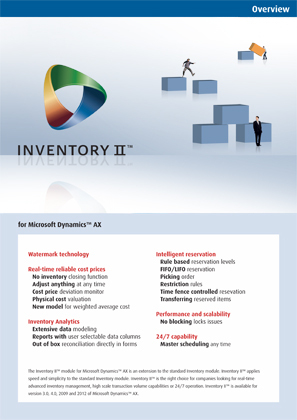 Inventory II is available for version 3.0, 4.0, 2009 and 2012 of Microsoft Dynamics AX. The Smart reservation module for Microsoft Dynamics AX / D365 is the right choice for companies looking for optimal ATP and smooth allocation in real-time mode. With Smart reservation, old fashioned physical reservations are no longer necessary to promise delivery capability towards the customers. Further, the lack of physical reservations ensures maximum allocation flexibility and the lowest possible inventory levels. Smart reservation is a must-have for any company within the Wholesale and Retail areas.